I have so much to blog about and can’t seem to narrow it down at any one time and focus on just one topic. I haven’t even finished writing up about my ride at Tevis this year! For this post I’ll just stick with writing about the pre-ride trail marking and such from the Bryce Canyon 5 day XP ride that was the first week of September. I left for the ride a week early, along with Dave Rabe. We knew that there would be a lot of work that needed to get done. Dave and Ann spent the summer in Alaska and now that they were back it was time to get to work! I met up with Dave Rabe (“DR”) in Carson City and we caravaned down to Bryce together, taking two days to get there. We had a pretty uneventful 600 mile trip aside from the usual stuff that goes wrong with DR’s truck (I swear it’s possessed and have named it “Christine”). The first day and a half after arriving we marked trail on foot, by jeep and I also rode out on Bo and marked some trail from camp. By Sunday, we and our horses were suitably rested up enough for us to head for a long day of trail marking of the canyons and trails on the Grand View trail. It turned out that this day was one of those days where if it could go wrong, it did. Tho not entirely, but enough did that we were just happy to finally make it back into camp, before dark. The Old Selam endurance ride near Centerville, ID, just North of Idaho City, is one of my all time favorite rides. The ride always delivers good footing, hills, scenery and creeks. Plus I love Idaho City, another old mining boomtown with many historic buildings. It’s always fun to take some time and check it out. I usually see something I haven’t paid attention to like the pictured jail, or as the sign calls it “Pest House”. Hard to believe these tiny towns had populations of around 3000 in their prime during the gold rush. The ride camp is on Oscar Baumhoff’s property on the banks of Henry Creek, a mining hot bed in the 1860’s. This has been home to the ride since 1996. 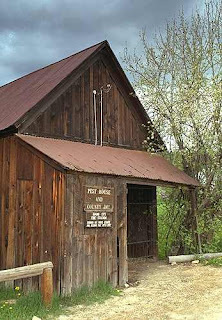 The ride was first held in 1976, when camp was near one of the old barns at the Old Idaho Penitentiary in Boise, which closed in 1973. I first rode it in 1979, and we took a tour of the old prison which is now a museum and all the houses have since been restored. “What an odd place for a ride?” is perhaps what you are pondering, and you might be thinking that I misspelled the name too. The ride name, Old Selam, is no mistake. Selam was a cart horse used at the prison. In his day he was a fine carriage and riding horse. 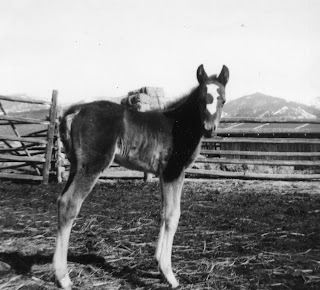 But in 1901 the aging grey gelding was used as an escape vehicle; not once but twice!